We have found that Scarpa mondopoint sizes do not correspond with those of other brands at the extreme ends of the size scale. Please do not hesitate to contact us should you like some help in deciding which size you need. 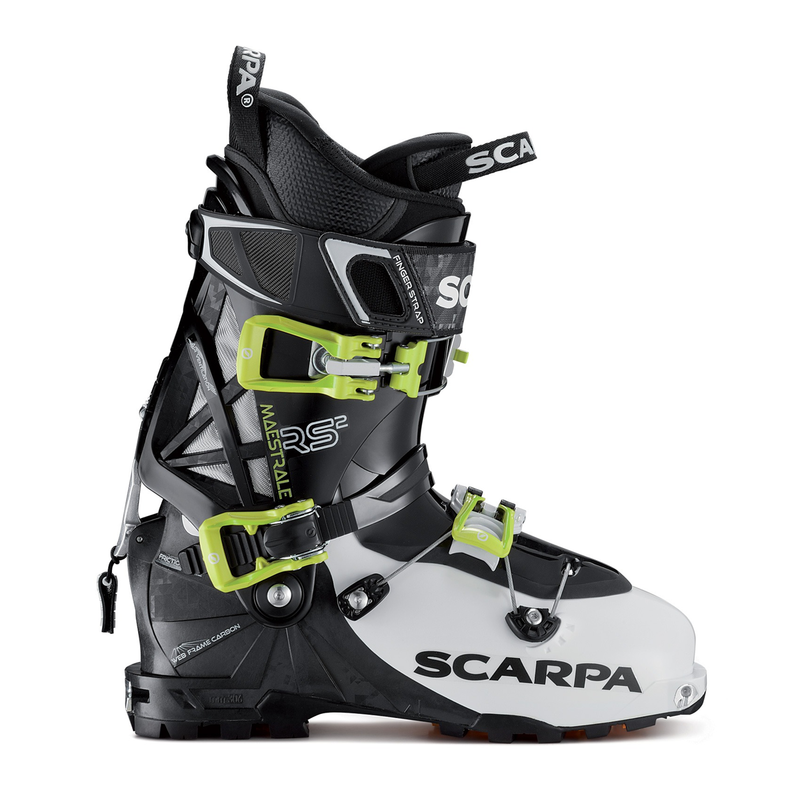 Please contact us if ordering Scarpa boots for delivery to the USA. The latest version of the popular Maestrale boot, the Maestrale RS is lighter, stiffer and even more comfortable and represents the new benchmark in ski touring boot design. Designed for advanced and expert ski tourers, the new geometry, technologies and materials confer excellent performance and ease of use when both climbing up and skiing down. Designed for use with both plate and insert alpine touring bindings and with skis up to 110 mm underfoot, the Maestrale RS is a latest generation AT boot. A stiffer and more powerful version of the popular Maestrale, the best-selling Maestrale RS offers freeride level skiing performance and lightweight backcountry functionality. The dual-injecton shell and cuff are made of Carbon Grilamid LFT, an innovative polymer that is light and stiff. The Maestrale RS has a shell/cuff design called Axial Alpine EVO for lightness and comfort and has a medium/wide 101 mm last that fits most feet. Scarpa have been using Intuition liners for many years now, and the Scarpa Cross Fit Intuition Pro Flex G perfectly balances touring comfort and downhill power transmission. The Maestrale RS has a Pebax split tongue and the cuff's Speed Lock Plus ski/walk mechanism gives a generous 60° rotation in walk mode for friction-less skinning and a smooth, natural movement when walking. In downhill mode the cuff has 16° forward lean which can be adjusted +/- 2°. The Maestrale RS features Scarpa's latest buckle format called the Wave Closure System. This allows optimum closure and customisation on the forefoot area with its micro regulation buckle and three teeth positions on the rack. The steel cable follows a wavy path across the boot, connecting the instep and forefoot area and works together with the buckle to improve the distribution of the closing pressure on the shell, increasing the downhill performance. The Thor buckle and rack wrap the cuff around the tibia for excellent control when skiing. Ski touring involves a lot of effort and to maintain comfort the Maestrale RS has ventilated areas on the cuff which are laminated with OUTDRY® technology. This allows the air circulation to keep the liner dry at all times. An excellent performance free-rando / freeride touring boot, the Maestrale RS meets the demands of the most demanding backcountry skiers and is fully recommended.